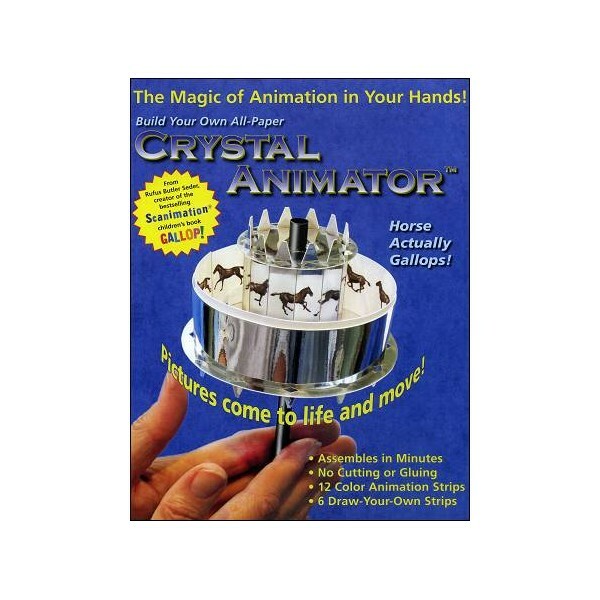 The CRYSTAL ANIMATOR is a version paper of a classic motion picture toy called a PRAXINOSCOPE, devised by the French artist-inventor Emile REYNAUD in 1877. 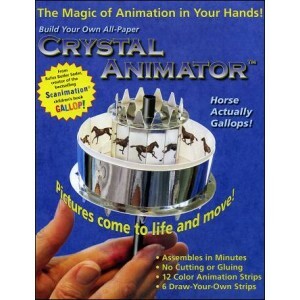 Made from sturdy mirrored paper, everyone can build and enjoy one of the greatest motion picture toys of all time ! Comes with eighteen (18 !) cartoons, this PRAXINOSCOPE has a diameter of 10 cm. The drum has a height of 3.5 cm. Very simple to build : simply detach the pre-cut pieces, follow the instructions in photographs and a few minutes later, your PRAXINOSCOPE is ready to use ! What is a Praxinoscope ? 02/14/2013 Christian. Comme indiqué sur les images, ça fonctionne très bien en faisant coulisser entre ses doigts. Très chouette pour ce prix !